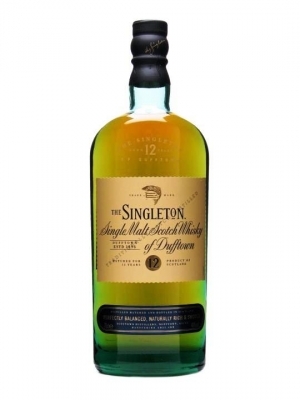 A relaunched Singleton, this time from Dufftown, to replace the now-defunct Singleton of Auchroisk. This smooth, mellow dram is designed to attract new drinkers to the malt category, while its smart packaging has ensured its popularity as a gift. Appearance: Deep gold, polished mahogany highlights. Nose: Approachable and rich. First polished wood and nuts (toasted hazelnut) dominate, then rich fruits, both stewed (baked apples) and dried (sweeet dates) take over, with soft brown sugar. Behind this, a stick of liquorice. Mossy. Water brings out a sweeter, more direct Speyside character (citrus fruits, pear drops!). Clean and dense. After a while, warm, dry aromas of pencil shavings or match-sticks. Palate: Sweetness and crunchy nuts impress at first, then there's a smooth, fruity Speyside richness to enjoy. Firm, with a balancing sweetness: hints of blackcurrant fruit, brown sugar and espresso coffee. Warming and pleasant. With water, still a pleasant texture. Light sweetness, then chewy and balanced by a light acidity, with a good spread of flavours mid-palate. Finish: Medium to long. Elegantly drying and crisp; then a sweetly nutty delayed warmth, which lingers pleasantly.